Stone Repair Mortar vs the Real Thing? Fixing the faces of the stone using stone repair mortar has become a huge industry in the United States in the past 20 years. Manufacturer’s of these products all have their reasons why theirs is the best and most compatible to the original stone substrates. Each company guards its proprietary mixes with closely kept secrets as to what and why theirs is the best on the market. Some companies claim acrylics in the formulas, where others claim natural minerals – whatever that means. Most offer custom color matching, some texture matching. Either way, the products are here to stay and will be an option on most restoration projects large and small. 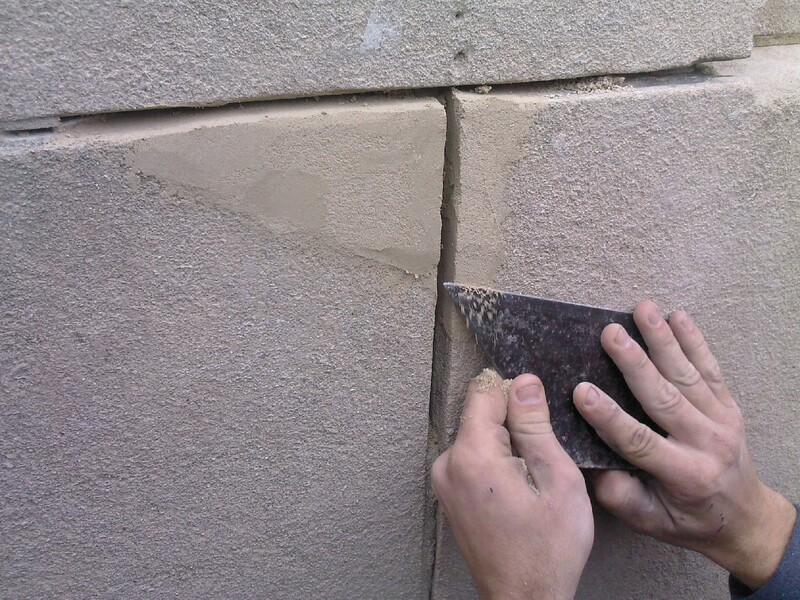 When is the best time to consider using stone repair mortar? Let’s first discuss the term – “repair mortar” not to be confused with “repointing” or “rebuilding mortar” that is used between stone and defined as mortar joints. A better term might be “substitute stone repair material” because that’s what it is – a substitute for the real thing. By definition a substitute stone repair material is a material that is used to patch damage or deteriorated surface masonry units’ insitu. When a stone is deteriorated beyond its original surface texture or carved feature it’s time to consider stone replacement or substitute stone repair patching. Each condition and situation is unique to each building or monument and care must be taken in making/specifying this important decision. Cost of replacement may be problematic and even unrealistic. The size of the repair area may be so small in comparison to that of the entire stone that the substitute stone repair material may be justified. But the decision should also be compared to the old fashion Dutchman repair approach as an additional option. It seems that the repair material products are so easy to use that many situations that could merit a stone Dutchman repair simply get the “patch”. On a recent project at the University of Wisconsin we were able to redress the deteriorated stone surfaces instead of applying a substitute stone repair material. The deterioration patterns were such that the surfaces had spalled and chipped away over the years leaving textures and stone massing voids from the profile of the walls. In many cases we were able to remove the damaged stone units redress them on a sand table, duplicate the original tools marks with hammer and stone chisels, and re-install the stone back to its original historic plumb lines of the wall. This was the best preservation practice approach for this project and one that limited the use of the substitute stone repair materials to the building. We did use a small amount of the material but only when all other stone treatment options were exhausted, which meant most substitute stone repair patches were on spots smaller than 1-inch in size. This entry was posted on September 29, 2011, 10:18 am and is filed under stone. You can follow any responses to this entry through RSS 2.0. You can leave a response, or trackback from your own site.